When I first pinned these vintage quilt pieces onto this tank top I went upstairs to ask Nekos his opinion. He was in the shower, but he stuck his head out of the curtain long enough to wrinkle his nose, shake his head vigorously, and tell me that I looked like a butterfly. I frowned and went back to the drawing board. And I had to consider the source -- a boy. But he was also sort of right. The way I had it pinned the quilt pieces were fluttering all over the place. In the end, I had to tear out my stitches several times before I got the pieces to lay flat. The key was to stand in front of a mirror and pin the pieces to the tank top while I had it on. 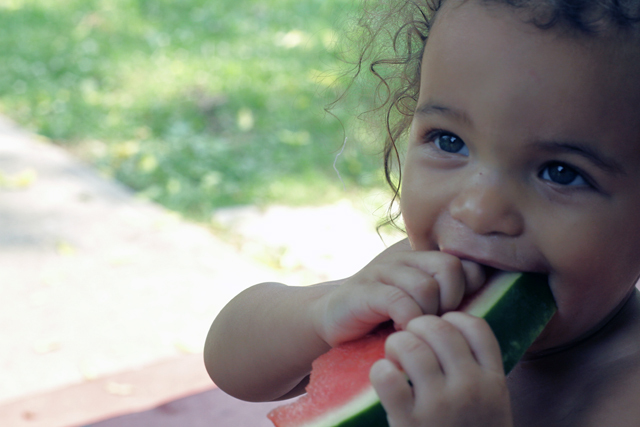 Nekos handed me this watermelon slice right as I was about to ask him to take a picture of the tank top I'd just finished. It was fate, I think, to have a watermelon prop. A new girlfriend gave me these gorgeous vintage quilt pieces. I've spent the past 30 minutes trying to figure out what this quilt style is called but I got nuthin' for ya. Holler at me in the comments section if you know. 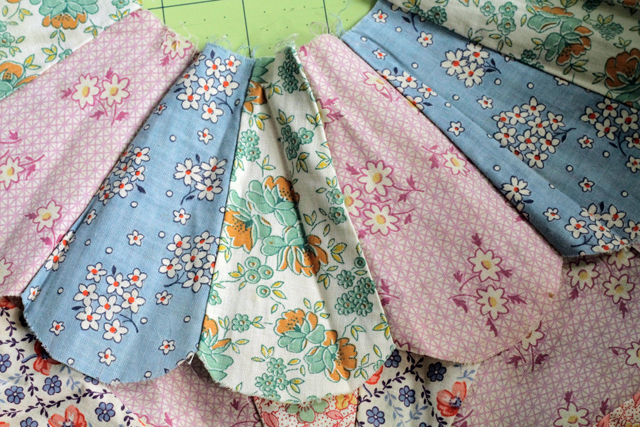 Anyway, along with these three "quilt flowers," as I'll call them, she also gave me the idea to use them as sleeves. I loved the idea as you can see. 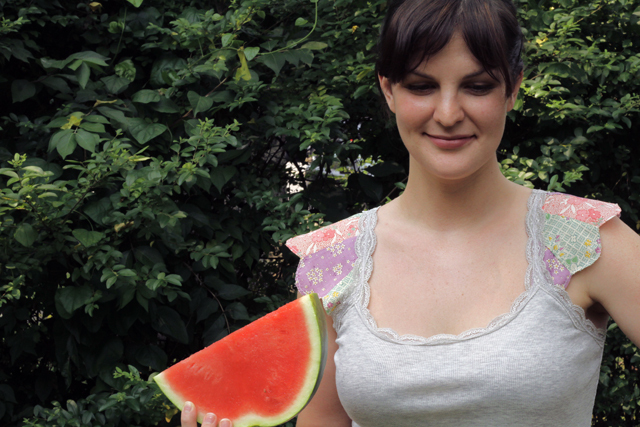 After I finished this shirt (and this piece of watermelon), I got to have several hours of me time. It had been awhile. We're talking shopping, manicure, pedicure, blaring car radio, the whole nine yards. When I got home Nekos said I should do it more often. He loved having Tessa to himself. They bonded. He made her a quesadilla and got in our completely ghetto (but awesome!) blow-up wading pool with her. I'm going to take him up on that. 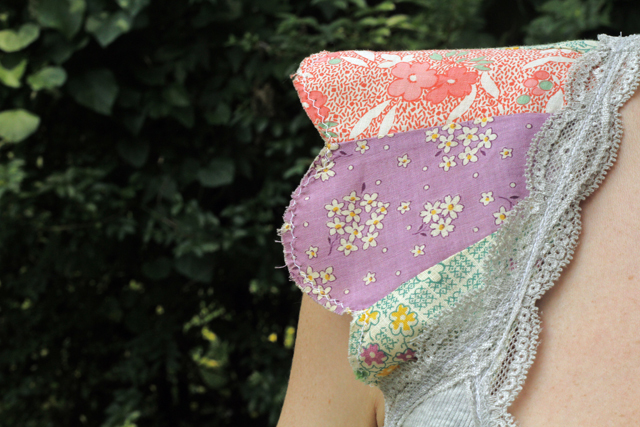 Have you seen my other quilt-inspired tank top? Oh! I love this tank top and it's little quilt sleeves!!! What a fantastic idea, I love the quilt flutter sleeves!! How cute is that?? And I am not sure what it's called but I have a friend I can ask. She said that these kinds of patterns on old quilts came from the feed bags for horses and cows -- in other words they would make the sacks out of really nice fabrics so that the farmers' wives (I guess?) could re-use them to make quilts. Love it! That pattern is one of my favorites--called grandma's flower garden. I have almost finished reading all of your blog entries back through June. Think I'll read a month's worth at a time. Getting to know you, getting to know all about you . . .